Mahkota Garden Condominium is a 3 blocks, 7-storey freehold condominium, which is located in the town of Bandar Mahkota Cheras and also boasts a 24-hour security service thus providing a safe residence for its inhabitants. In it, residents can have a constant peace of mind as well as practice a healthy living throughout the neighbourhood. Despite the all day long security in placed within the residences, the Management found that their security arrangements are not truly efficient as there are many aspects that are not taken into consideration. For one, there is no system installed thus nothing is being recorded, i.e. amount of visitors accessing the compounds, incidents happening and so on. Hence, the Management decided that in this case, a solution is much needed to manage its security. Mahkota Garden appropriately chooses i-Neighbour from its list of competitors as it discovers that our Smart Community System is more user-friendly as well as versatile. As a result, Mahkota Garden Condominium is now utilizing i-Neighbour (specifically on the visitor management aspect and Incident Report feature) with over 400 units subscribed within its management system. With i-Neighbour, pre registration of visitors can be done conveniently at the guardhouse and the Blacklist feature also allows the security guards to restrict the visitors from entering the neighbourhood if deemed suspicious. 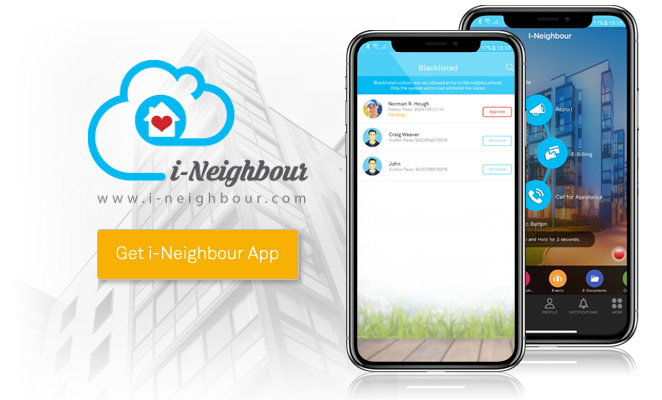 Since i-Neighbour operates in the cloud, all data records will be safely stored and easily accessible for the Admins of the neighbourhood via Smartphone in addition to the Web. What’s more, its Incident Report feature allows for both the Management and Residents to report any incidents that are or have occurred in the community thus providing the personnel in charge the capability to rectify the issues as soon as possible. i-Neighbour is a Smart Solution that is designed to ease the management of the neighbourhood and is applicable to both high-rise residential buildings and gated guarded communities. Furthermore, i-Neighbour can likewise be integrated with an array of IoT Smart Security Series. Click the links below now to find out more!